Eq. Tower, which will include 633 apartments over 63 levels. Located at 127 - 141 A'Beckett Street, near Elizabeth Street in Melbourne's CBD, the 200-metre-plus tower will feature a mix of one, two and three bedroom apartments architecturally designed by Elenberg Fraser, all of which sold out in less than eight months last year. Eq. Tower will also include a 25-metre outdoor swimming pool and BBQ area, indoor gym, sauna, spa, private dining rooms, karaoke suites, cinema, games room and lounges. According to the developer, Eq. Tower has a curtain wall glass façade designed using a parametric equation, which analysed weather patterns, sunlight, views and apartment usage to ensure no space was underutilised and natural light could be delivered to all living and bedroom spaces. The development will include a green wall façade on the podium, rainwater harvesting and re-use, photovoltaic solar panels, water efficient fixtures and appliances and high-performance double-glazing. ICD Property Director of Finance and Development Manager, Matthew Khoo, described the project as complex in terms of its scope of amenity, its intricate curved façade and the innovative techniques used to design the building. "With this in mind we knew we wanted to partner with Brookfield Multiplex due to their long-standing reputation for delivering world-class, complex projects," Mr Khoo said. "The development will immediately transform A'Beckett Street through its shopping and café offering, while being a short stroll from the city's iconic landmarks such as Melbourne Central and the Queen Victoria Market. 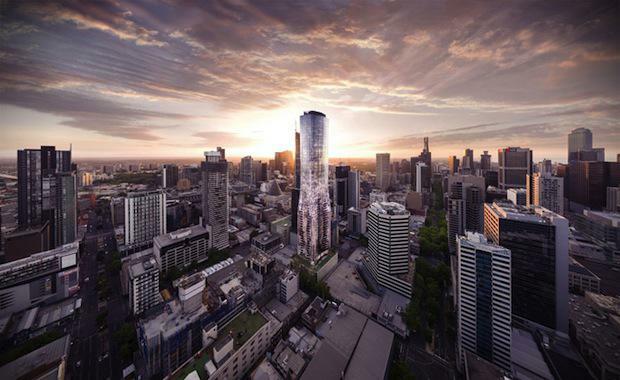 "Graham Cottam, Regional Managing Director of Brookfield Multiplex Victoria, said the project will build on the company's strong credentials in delivering high-rise apartments in Melbourne's CBD. Brookfield Multiplex currently has five projects under construction in Melbourne's CBD, including the $300 million Prima Tower in Southbank, $280 million Platinum tower in Southbank and the final two stages of Upper West Side Apartments in the CBD valued at $300 million. With construction of the development already under way, Eq. Tower is due to be completed in June 2017.